Resilience – the ability to bounce back when faced with adversity – is a characteristic that even our youngest children need. Many young children and their families face early stressors in life such as maternal depression, natural disasters, poverty, violence and homelessness. These experiences might happen one time such as the death of a family member or stressful events can happen over time such as multiple years of homelessness. Sometimes, these experiences lead to trauma for a child. Resilience helps children cope with change and adversity and experience more positive outcomes. In infants and toddlers, resilience may be strengthened through protective factors found in the family, the environment in which the child lives and plays, and within the child him or herself. The promotion of within-child protective factors is the focus of DCRC — to help all children and adults develop strong protective factors, and thus, become resilient! Within-child protective factors that strengthen infant and toddler resilience are closely tied to their social and emotional well-being – the ability to form relationships, get their needs met, regulate strong emotions and explore their world. The Devereux Early Childhood Assessment for Infants and Toddlers (DECA-I/T; Mackrain, LeBuffe & Powell, 2007) is a psychometrically sound, strength-based assessment that measures protective factors in young children ages 4 weeks to 36 months; specifically, Attachment/Relationships, Initiative, and Self-Regulation. The DECA-I/T consists of two assessments: the DECA-I (Infants) and DECA-T (Toddlers). Both tools are strength-based assessments, normed on a nationally representative sample of over 2100 infants and toddlers. The DECA-I/T is completed by families (parents, grandparents, foster parents) and early care and education professionals (teachers, child care providers, home vistitors) and measures two social and emotional constructs in infants, and three in toddlers, and provides scale and total scores. Attachment/Relationships: Attachment is the ongoing, emotional relationship the child builds over time with a familiar adult through nurturing interaction. The warm connection a child has with another familiar person is called a relationship. Initiative: Initiative is the child’s ability to use independent thought and action to meet his or her needs. Self-Regulation (Toddlers): Self-Regulation is the child’s ability to gain control of bodily functions, manage powerful emotions, and maintain focus and attention (Shonkoff & Phillips, 2000). ~ Mackrain, M. and Blackwell, K.T, Infant and Toddler Strategies Guide, 2009. 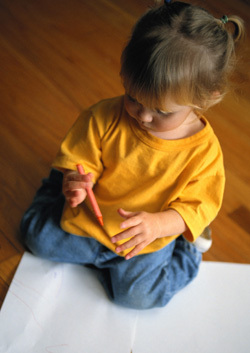 In addition to helping childcare, home visitation and other early care and education programs such as Early Head Start programs document that children’s needs are being met, the DECA-I/T can help early care and education professionals and families in strengthening the social and emotional development of all children with more intentionality and individualization. Specifically, the DECA-I/T provides detailed information on children’s social and emotional strengths and needs by scale and even by item. By aggregating individual data, the caregiver can also gain insights into common areas of strengths and needs for the group as a whole. The results can then inform an early childhood program or Early Head Start Program to be more intentional, perhaps stressing certain social and emotional skills or providing additional opportunities for practice and feedback by integrating emphasis on social and emotional skills. For more information about this resource designed to support early care and education professionals and families promote social and emotional health in infants and toddlers, see the Devereux Early Childhood Assessment for Infants and Toddlers (DECA-I/T).